Publisher: Namco Ltd., Sunsoft Inc.
Sky Kid (スカイキッド, Sukai Kiddō) is a horizontal scrolling shooter arcade game that was released by Namco in 1985. It runs on Namco Pac-Land hardware but with a video system like that used in Dragon Buster. It is also the first game from Namco to allow 2 players to play simultaneously. The game was later released on the Famicom (brought to the American NES by Sunsoft), and both this version and the original arcade version were later released on Nintendo's Virtual Console service. 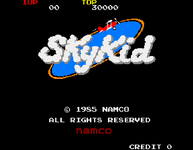 Sky Kid is a two-dimensional, scrolling shooter game. The players play as the Sky Kids "Red Baron" and "Blue Max", which are references to Manfred von Richthofen, the famous World War I flying ace, and the prestigious order Pour le Mérite, informally known as Blue Max. The Sky Kids fly around in biplanes and are assigned specific targets during the missions. These missions involve bombing specific targets. The "A" button is used to control the plane's machine gun and the "B" button is used to perform a loop. A number of obstacles face the player in each level. First, their biplane is not equipped with a bomb to complete their mission, and must be picked up en route to the target. Second, there are both ground and air units that attempt to keep the Sky Kids from accomplishing their mission. Last, the Sky Kids may have to navigate through some very inhospitable terrain or navigate around cities in order to get to the target. The targets that the Sky Kids must bomb will either be a fortress complex or a ship. As the player moves farther up in the 9 missions, multiple targets will begin to appear in the course of one mission. Players receive points for destroying air and ground targets, receiving additional points for how many of these types of targets are destroyed. In addition, players get points based on how much of the target is destroyed. Sometimes blowing up enemy units will reveal a hidden Namco icon or character, including Pac-Man, Inky, the Special Flag from Rally-X (which has appeared in many other Namco games) or Pooka from Dig Dug. If the player does a loop in front of girls, the girls send out hearts representing kisses. If the player shoots them, they turn into waving dogs. Source: Wikipedia, "Sky Kid," available under the CC-BY-SA License.